In this process, the gear blank is rolled with a rotating cutter called hob. Gear hobbing is done by using a multipoint cutting tool called gear hob. It looks like a worm gear having a number of straight flutes all around its periphery parallel to its axis. These flutes are so shaped by giving proper angles to them so that these work as cutting edges. In gear hobbing operation, the hob is rotated at a suitable rpm and simultaneously fed to the gear blank. The gear blank is alos kept as revolving. Rpm of both, gear blank and gear hob are so synchronized that for each revolution of gear bob the gear blank rotates by a distance equal to one pitch distance of the gear to be cut. Motion of both gear blank and hob are maintained continuously and steady. 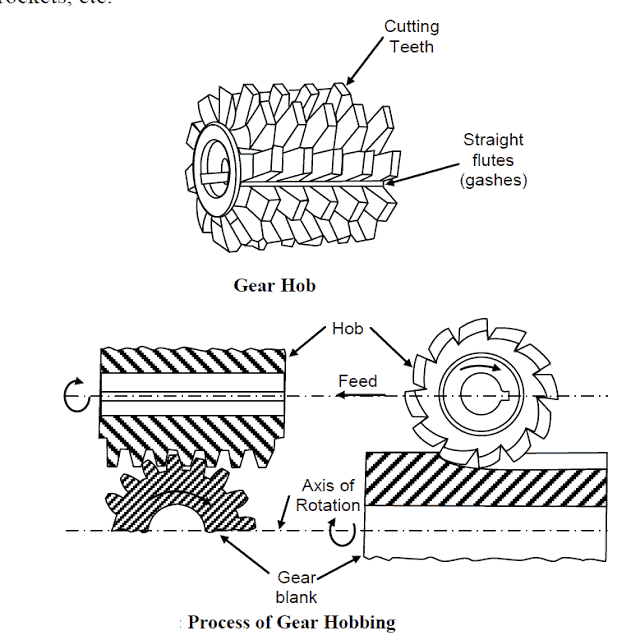 A gear hob is shown in Figure 6.8 and the process of gear hobbing is illustrated in Figure . The hob teeth behave like screw threads, having a definite helix angle. During operation the hob is tilted to helix angle so that its cutting edges remain square with the gear blank. Gear hobbing is used for making a wide variety of gears like spur gear, helical, hearing-bone, splines and gear sprockets, etc. Three important parameters are to be controlled in the process of gear hobbing indexing movement, feed rate and angle between the axis of gear blank and gear hobbing tool (gear hob). The process of gear hobbing is classified into different types according to the directions of feeding the hob for gear cutting. The classification is described as given below. In this process the gear hob is fed against the gear blank along the face of the blank and parallel to its axis. This is used to make spur and helical gears. In this method the hob and gear blanks are set with their axis normal to each other. The rotating hob is fed against the gear blank in radial direction or perpendicular to the axis of gear blank. This method is used to make the worm wheels. This is also used for cutting teeth on worm wheel. In this case, the hob is held with its axis horizontal but at right angle to the axis of the blank. The hob is set at full depth of the tooth and then fed forward axially. The hob is fed tangential to the face of gear blank. (a) Gear hobbing is a fast and continuous process so it is realized as economical process as compared to other gear generation processes. (b) Lower production cycle time, i.e. faster production rate. (c) The process has a larger variability’s in the following of sense as compared to other gear machining processes. (i) Capable to make wide variety of gears like spur gear, helical gears, worms, splines, sprockets, etc. (ii) Process of required indexing (named so) is quite simplified and capable to make any number of teeth with consistent accuracy of module. (iii) A special type of gear named harringbon gear cam be generated by gear hobbing exclusively. (iv) Wide variety of batch size (small to large volume) can be accommodated by this process. (d) Several gear blanks, mounted on the same arbor, can be processed simultaneously. (e) Hob is multipoint cutting tool having multi cutting teeth or edges at a time few number of cutting edges work so lots of time is available to dissipate the generated heat. There is no over heating and cutting tool. In addition to above mentioned large number of advantages there is one glaring limitation of the process of gear hobbing. That is manufacturing of internal gears is not possible.